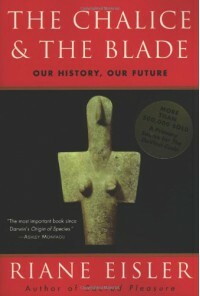 The Chalice & The Blade is Riane Eisler's review of humanity's prehistory from Paleolithic through Neolithic times with emphasis on the change of our culture from a cooperative, goddess-worshipping society where men and women live in parity (the Chalice), to a competitive, male-dominated society where women are subjugated (the Blade). What is it that chronically tilts us towards cruelty rather than kindness, towards war rather than peace, toward destruction rather than actualizaion? The traditional answer is that there is indeed something "wrong with us." Either a defect in the human genome, or a spiritual problem (such as "sin"). Consequently, people are not to be trusted and can only live together in relative peace when a strong government (or other ruling structure) exercises enough force to keep everyone in line (or when acceptance of the right dogma frees people from sin). All these otherwise widely divergent societies are not only rigidly male dominant but also have a generally hierarchic and authoritarian social structure and a high degree of social violence, particularly warfare. These invaders are identified by Ms Eisler as the Kurgan-- Indo-Europeans who spoke the Aryan language group. Many were from the Caucasus region north of Turkey. They were practitioners of agriculture as much as the Old Europeans, but the society they built around it was based on a might-makes-right philosophy that tended to concentrate the gains of agriculture into the hands of a ruling minority. The violent ways of the Kurgans made them successful in supplanting the peaceful Old Europeans and the switch to fortified cities in Europe was a result. Another was the legacy of hierarchy and rule-by-force that has plagued humankind since. Ms Eisler does a great job in the first part of her book in making her case for the peaceful, goddess-worshiping culture of the Paleolithic in Europe. She indicates the vast quantities of feminine figurines, cave art, and the art of Crete that speak of societies that honored life as originating with the female, and of women and men working as equal partners in managing the concerns of settled living for at least tens of thousands of years (with the implication of much longer). That all ended with the Kurgan invasions, which came in three major waves, wiping out the partnership culture and replacing it with the dominator one. ...the life-giving and nurturing Chalice as the supreme power in the universe has been displaced by the power to dominate and destroy: the lethal power of the Blade. And it is this reality that to our day afflicts all humanity--both women and men. I think The Chalice & The Blade is perceived as a feminist book, and while I think that's true (and is certainly no slight to the book), it is a mistake to see it as that black-and-white. Ms Eisler makes the point that the partnership culture of Old Europe, while it worshiped the Goddess and venerated women, was not simply the opposite to a patriarchal culture. Men were not subservient to women, but were indeed, partners. So the value in this book, in my opinion, is in its revelation concerning "what happened." It is in its averring that there is nothing wrong with humans, but much that is wrong with the structure of the society impressed on people from the dominator culture that allows no rivals. Now even nature seems to be rebelling against androcracy...the evidence mounting from every quarter is that the prevailing system is rapidly nearing its logical evolutionary end...What may lie ahead is the final bloodbath of this dying system's violent efforts to maintain its hold. She makes the "death throes" point several times, but ends with a long section on how much better life will be when the partnership culture returns to prevalence. But the death throes of androcracy could also be the birth pangs of gylany and the opening of a door into a new future. I highly recommend The Chalice & The Blade as essential reading in anyone's study to understand how our current culture came to be and why things are as they are. It is especially enlightening when read in conjunction with Daniel Quinn's Ishmael books.